A saliva-powered fuel cell has been created by researchers at Penn State that can produce enough energy to run on-chip applications; new analysis by MIT scientists examines charge transfer in porous battery electrodes. According to researchers at Penn State who’ve created a saliva-powered micro-sized microbial fuel cell, their invention can produce minute amounts of energy sufficient to run on-chip applications. Researcher Justine E. Mink has been credited with the idea as she was thinking about sensors for such things as glucose monitoring for diabetics and wondered if a mini microbial fuel cell could be used since there is a lot of organic stuff in saliva. Microbial fuel cells create energy when bacteria break down organic material producing a charge that is transferred to the anode. Wastewater is often looked to as a source for both the organic material and the bacteria to create either electricity or hydrogen, but these tiny machines are a bit different. By producing nearly 1 microwatt in power, this saliva-powered, micro-sized MFC already generates enough power to be directly used as an energy harvester in microelectronic applications, the researchers said. They believe that the emergence of ultra-low-power chip-level biomedical electronics, devices able to operate at sub-microwatt power outputs, is becoming a reality. One possible application would be a tiny ovulation predictor based on the conductivity of a woman’s saliva, which changes five days before ovulation. The device would measure the conductivity of the saliva and then use the saliva for power to send the reading to a nearby cell phone. The electrochemical reactions inside the porous electrodes of batteries and fuel cells have been described by theorists, but never measured directly – until now. A team at MIT has figured out a way to measure the fundamental charge transfer rate and found some significant surprises. The researchers found that the Butler-Volmer (BV) equation, usually used to describe reaction rates in electrodes, is inaccurate, especially at higher voltage levels. Instead, a different approach, called Marcus-Hush-Chidsey charge-transfer theory, provides more realistic results — revealing that the limiting step of these reactions is not what had been thought. The new findings could help engineers design better electrodes to improve batteries’ rates of charging and discharging, and provide a better understanding of other electrochemical processes, such as how to control corrosion. 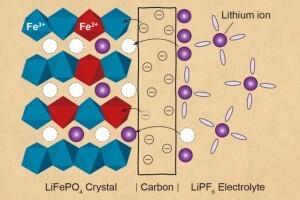 Previous work was based on the assumption that the performance of electrodes made of lithium iron phosphate — widely used in lithium-ion batteries — was limited primarily by how fast lithium ions would diffuse into the solid electrode from the liquid electrolyte. But the new analysis shows that the critical interface is actually between two solid materials: the electrode itself, and a carbon coating used to improve its performance. Analysis shows that both transport steps in solid and liquid — ion migration in the electrolyte, and diffusion of “quasiparticles” called polarons — are very fast, and therefore do not limit battery performance. Further, they found that it’s actually electrons, not the ions, transferring at the solid-solid interface that determine the rate. Researchers had not suspected, despite extensive research on lithium iron phosphate, that the material’s electrochemical reactions might be limited by electron transfer between two solids. This is a completely new picture for this material; it’s not something that has even been mentioned before. The new analysis means that to make further improvements in this technology, the focus should be on how to engineer the surface at the solid-solid interface. This new understanding could have implications far beyond electrode design, since the fundamental processes the team uncovered apply to electrochemical processes including electrodeposition, corrosion, and fuel cells.